Hot on the heels of the top-end AMD chipset, the FX990, is a little Intel lovin' by way of Sapphire's brand new Pure Black X79N. 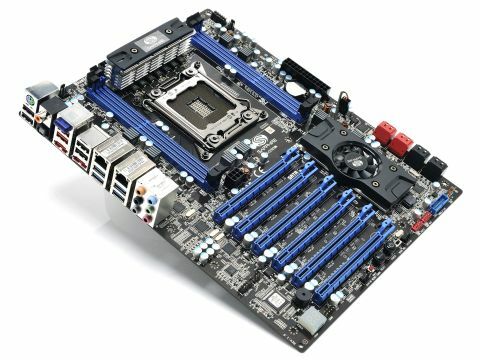 Like the Sapphire Pure Black FX990, this is Sapphire's top-end motherboard for someone's highest-spec desktop chipset, and this time it's the turn of Intel's X79/Sandy Bridge E platform. The Pure Black X79N, like most of Sapphire's latest boards aimed at the enthusiast end of the market, is full to the brim with features. This is no more then you should expect on a motherboard aiming its beady eye at this particular market segment. However although the pricing is yet to be confirmed, the feature load is likely to be reflected in the price tag. When we say full to the brim, that's a bit of an understatement - the Sapphire Pure Black X79N comes with no less than six PCIe x16 slots, two of which support the latest Generation 3 specs. It also has eight SATA ports (six of which are SATA 6Gbps), dual Gigabit LAN, four USB 3.0 ports and integrated Bluetooth connectivity.